Oily fish is known to have many health benefits due to the heart-healthy essential fatty acids it contains. A quick, convenient way to meet your oily fish quota without having to cook is to grab a canned variety, such as sardines. While these are healthy options, there is a chance you could overdo it and eat too many sardines, which could pose a few problems. One potential danger associated with eating fish on a regular basis is the risk of ingesting too much mercury. Those who particularly need to watch their intake of mercury are pregnant women and women looking to get pregnant, warns the Food Standards Agency. David Evers, executive director of the Biodiversity Research Institute notes that even relatively low intakes of mercury can be potentially damaging to any person's health. While certain fish such as shark, marlin and swordfish contain higher levels of mercury, sardines are classed among the lowest mercury-containing fish. The American Pregnancy Association advises that pregnant women and those looking to conceive should limit their intake to two 6-ounce servings each week. For otherwise healthy individuals, a higher intake than this shouldn't be an issue. Bisphenol A is a chemical that can be found in some cans and bottles of the food you eat. Dr. Jen Landa, chief medical officer of BodyLogicMD, says BPA has been shown to increase tumor growth and also could increase the risk of developing diabetes, heart attacks and breast cancer. Your best bet for avoiding BPA is to look for sardines that come in BPA-free cans or to choose fresh sardines. The health risks involved with eating sardines are relatively small compared to the benefits gained from eating them. 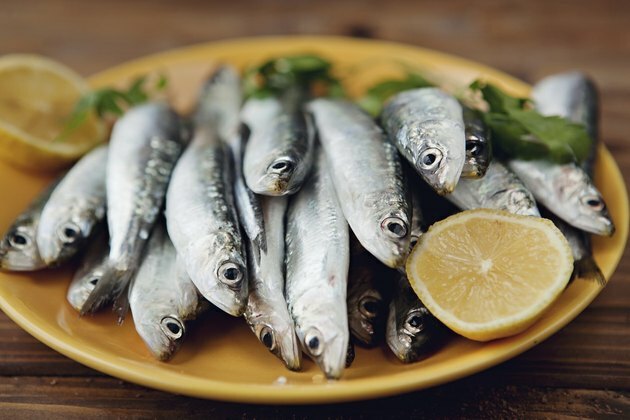 Sardines are high in healthy omega-3 fats, which can reduce inflammation and help with infant brain development. American Heart Association guidelines recommend eating a minimum of two 3.5-ounce servings of oily fish, like sardines, each week.